A couple of weeks ago we visited a wonderful farm for a 'Traditional Country-style Breakfast'. We'd driven 2 days to get there (it was on our route and there was nothing else we knew of to visit anyway) as it's only open on weekends. It was very worth it. The place is Babilônia Farm (Fazenda Babilônia in Portuguese), West of Brasilia and near Pirenopolis. When we arrived it was explained that we'd have to wait a little while, as this was 'Slow Food', but in the mean time we would be given a tour. At Fazenda Babilônia you don't have to choose what to eat: all 40 dishes are put on the table in front of you! (Fortunately they are all small portions). We were given a copy of the 'menu' in English but it's more than a menu: it explains each dish. Ingredients: ground free range chicken, ground pork belly, turmeric, bode pepper, eggs, homemade corn flour. Interesting fact: wrapped in corn husks and roasted over the borralho - hot ashes; A typical dish eaten by the Tropeiros - Brazilian cattle drivers. Every dish was explained like this, with Ingredients, and then what made it interesting. 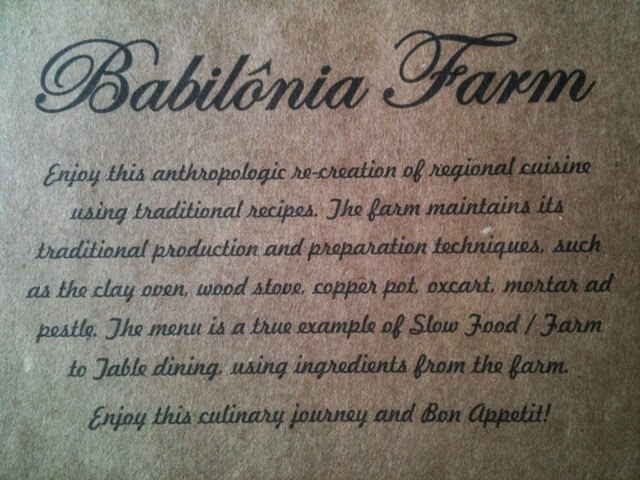 Ingredients came from the farm, they killed their own free range chickens, pigs, and beef, and traditional production and preparation techniques are used: such as clay oven, wood stove, oxcarts and mortar and pestle. We loved it, and I'd go again if I was in the area. Here's the back of the English menu. You can learn more at www.fazendababilonia.com there is an English language option at the top of the page.